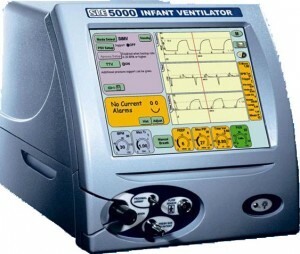 SLE5000, a neonatal/infant ventilator equipped with a flow sensor and graphic functions, is based on SLE2000 series’ unique pneumatic system which does not use an expiratory valve (“opposing jet system”). The model provides pressure limited, time cycled ventilation as well as pressure limited, volume targeted ventilation (TTV) and HFO. The available ventilation modes include CPAP, CMV, PSV, PTV and SIMV. The user interfaces are touch panels on the full-colour front screen. The ventilator operates mainly based on a flow sensor. However, thanks to its excellent pressure trigger system, it is effectively used in low-birth weight neonates even with a flow sensor disconnected. It carries a backup battery for emergency such as electric power failure. Though the basic structure is similar to SLE2000 series, with the newly mounted full-colour screen, the external appearance of SLE5000 is considerably different from its predecessors. The layout of expiratory block, fresh gas port and airway pressure port on the left side of the device has not been changed from SLE2000. All the settings are accessed through the touch panels. 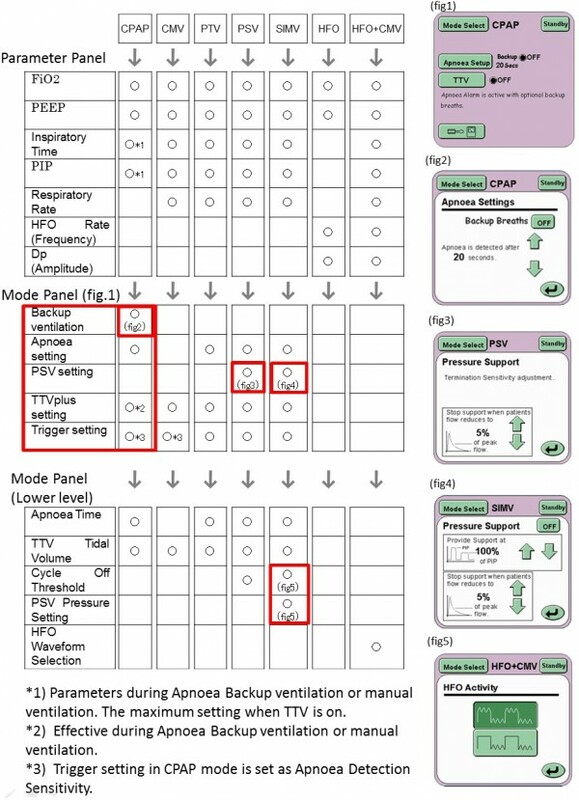 Selection of ventilation mode, calibration of flow/O2 sensors, setting of leak alarm and pressure waveform are performed through the mode panel (Fig.1). 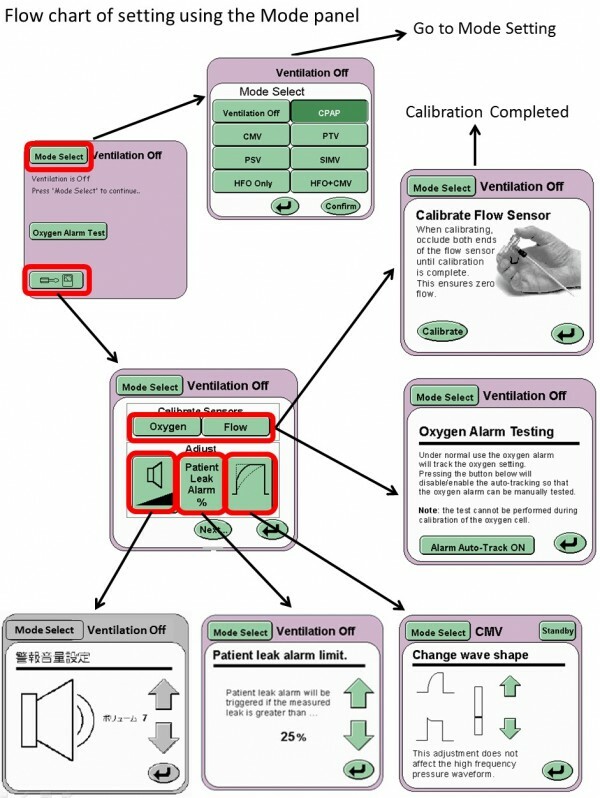 On the parameter panel, respiratory rate, PEEP, PIP and FiO2 are selected. For TTVplus mode, tidal volume is also set. For HFO mode, HFO rate and dp(delta pressure i.e., amplitude) are adjusted on this panel as well. The value displayed in minute letter at the right upper corner of each parameter window is a setting. An actual measurement is indicated in the centre in large font (Fig.2). When setting each parameter, the selected parameter turns white and the cursors appear on the right margin. The parameter then can be adjusted by touching the up and down cursors. Pre-set parameters are displayed before mode selection. Mode can be changed after adjustment of parameters is completed. On the lung mechanics/measurement panel, actual measurements of parameters are displayed for each mode. When using a flow sensor, BPM tot (total number of breaths per minute) is a total number of mandatory breaths, triggered breaths and all the breaths which fail to reach set flow trigger sensitivity, equalling to the total respiratory rate of a patient. However, if a flow sensor is not used, only the number of mandatory breaths and triggered breaths is counted. When a unit is turned on, the default settings of parameters are displayed as listed. However, if a unit is turned on within 2 minutes from the power shutdown, the settings during the previous session may be displayed. If a unit is turned on 2 minutes or more after the shutdown, all the previous settings are reset to the default settings. O2 calibration is automatically carried out when a unit is turned on, after 10 min, 30min, 90 min of operation, and every 8 hours during operation. When adjusting a parameter setting, it is only up to 10 scale resolutions that the setting increases/decreases per each press of the cursor button. For example, PIP setting which is incremented by the cmH2O, can rise up to 10cmH2O by pressing the cursor button one time. Also, if the original Ti is 0.30 sec and the button is pressed, Ti increases up to 0.40 sec as the scale resolution is 0.1sec. By pressing the cursor, HFO rate of 10Hz will be changed to 12 Hz as the scale resolution is 0.2Hz. It should be noted that TTV has two scale resolutions, which are 0.2mL for the TTV range of 2.0～6.0mL and 1mL for the range of 6.0mL or more. Therefore, if the original setting is 3.0mL, it may be increased to 5.0mL but if the original setting is 5.0mL, pressing a cursor will increase the setting to 10mL. Exceptionally, FiO2 level can be increased to 100% by pressing the cursor button only one time. However, FiO2 level can be reduced only by 10% per each press of the cursor button. 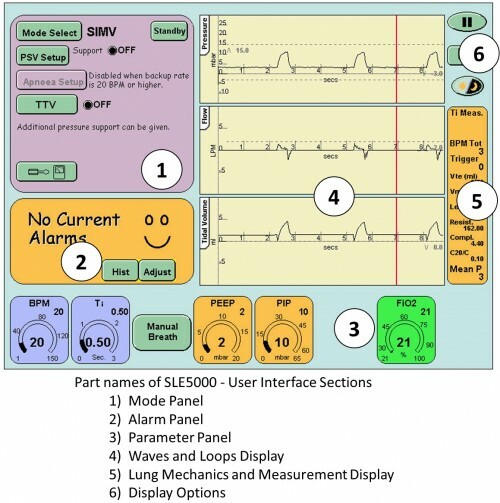 SLE5000 delivers breaths in the CPAP, PTV, PSV, SIMV, HFO and HFO+CMV modes. Also, it features TTV plus, which is a type of PRCV (pressure regulated volume control ventilation) and allows superimposing PSV with a separate pressure setting over SIMV. 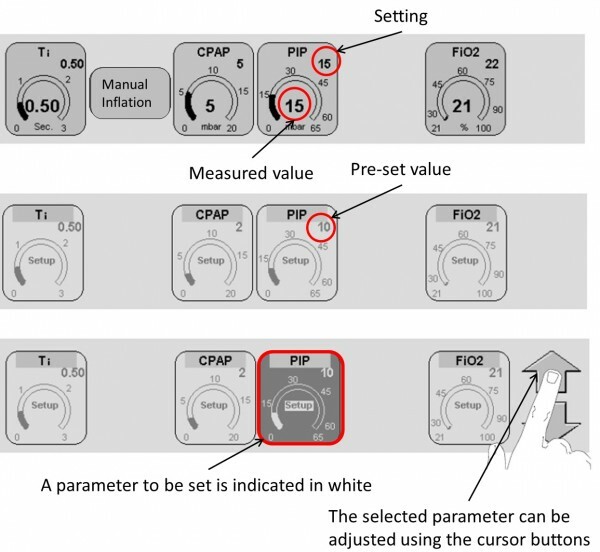 In the CPAP mode, Backup ventilation is available after a certain period of apnoea, according to the set apnoea detection time and Backup ventilation settings (Fig.3, b). During Backup ventilation, a unit delivers mandatory breaths at a pre-determined inspiratory time and PIP settings after the elapse of a set apnoea time (min. 5sec). Furthermore, it is possible to set tidal volume for Backup ventilation using TTVplus. However, as the minimum apnoea time is 5 sec, mandatory breaths are delivered every 5 sec at most. For the use of neonates, the device may require some improvement concerning this point. The set parameters for Backup ventilation are effective during manual ventilation. Apnoea detection time can be set in modes other than CMV if RR is 20 BPM or less. Backup ventilation rate is determined based on the respiratory rate set on the parameter panel. TTVplus can be applied in every mode including CPAP but except HFO. The details will be described in the next article. In the PSV mode, a cycling off threshold can be determined (Fig.3, c). This function is equivalent to the termination sensitivity in the PSV mode of Bear Cub 750psv and Babylog®8000plus, which was explained elsewhere. The default setting of a cycling off threshold is 5% (the termination sensitivity is fixed at 15% in Babylog® 8000 plus). As the current version of this model features the Leak Compensation, adjustment of a cycling off threshold may be unnecessary. During SIMV, it is also possible to further add PSV (Fig.3, d) and pressure settings for PSV are determined as relative values (%) against PIP. During HFO+CMV, it is possible to select a waveform of mandatory breaths in CMV mode. It is also selectable whether to continue HFO during mandatory breaths (Unlike SLE2000HFO, SLE5000 does not have a function to generate HFO waveform only during the inspiratory phase). SLE5000 is able to ventilate in PTV and SIMV modes without a flow sensor. Also, it is possible to superimpose PTV with separate pressure settings over SIMV as in the case of SIMV+PSV. Like SLE2000, pressure trigger system of SLE5000 detects not an absolute negative pressure during spontaneous breaths but its pressure slope. In SLE5000, the trigger sensitivity is considerably improved and is so sensitive that when PTV is delivered to a breathing circuit connected to a test lung without a flow sensor, the unit may auto-trigger, reacting to the recoil of the test lung’s inflation-deflation movement. This means that it is necessary for clinicians to make sure if breaths are genuinely triggered by a patient’s breathing effort or auto-triggered. Though SLE5000 is a pneumatic ventilator with a similar construction to SLE2000, a constant flow through the inspiratory limb is increased from 5 to 8L/min, resulting in more condensation/water in the filter than SLE2000. As a fair amount of water in the expiratory filter causes resistance to filter efficiency, PEEP and PIP may go beyond the settings. In order to avoid this, it is necessary to replace an expiratory filter frequently. At our hospital, a filter change is performed on a daily basis. Consider this point if measurements are found 2cmH2O or more higher than the settings. Though SLE2000 series are well compatible with Kawaguchi nasal CPAP, SLE5000 requires some precaution when being used for this method. Characteristically, Kawaguchi nasal CPAP uses a small cannula. As SLE5000 provides a constant flow of 8L/min to the inspiratory limb, the cannula resistance at the expiratory limb may increase especially if a leakage at the mouth is small. This may cause a significant gap between the setting and the measurement. Please note that in SIMV mode, the relative PSV pressure (%) against PIP is calculated based on the absolute PIP not above PEEP.